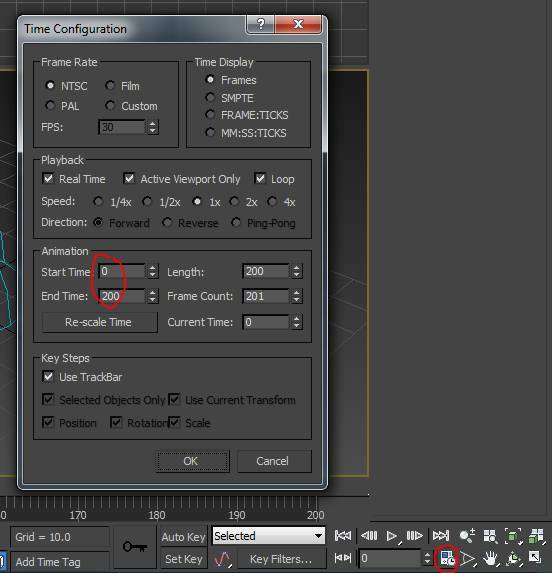 Then you set the “Time Configuration” to how many frames you want in the animation. Click “Auto-Key” and move the slider to the last frame and put in values for the “Motion Phase” and “Drift” in “Environment and Effect” window. 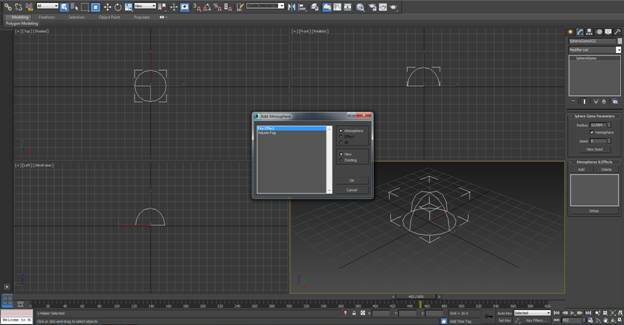 Since the fire animation does not show in the 3ds Max viewport, render the output to an AVI file. This is what I did. 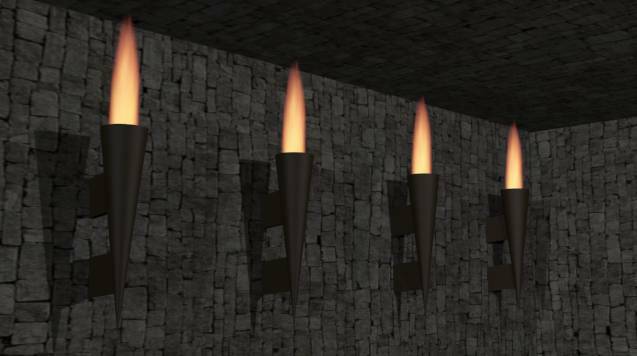 I also created a spooky animated scene of a dungeon with different fire effects. Scroll down to the bottom of this tutorial to see the images. And don’t forget to watch my AVI output in the video below. First create an Atmospheric Gizmo from Create > Helpers > Atmospheric Apparatus > SphereGizmo. You can use any gizmo you prefer. I will use the Sphere Gizmo and Box Gizmo for the scene. Check mark Hemisphere to cut it in half. Select the gizmo and go to modify panel. In Atmosphere & Effects click Add and select Fire Effect. Now select the Fire Effect in the list and click on Setup to open the Environment Effects window. In that window, scroll down and look for the settings. 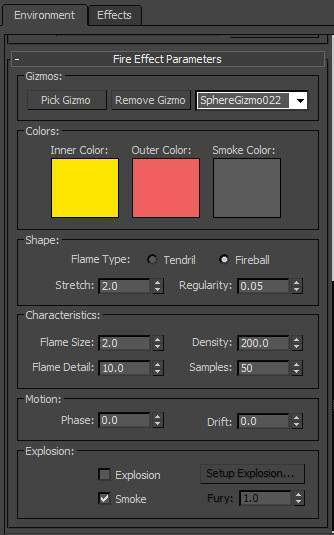 You can change the Inner and Outer Color of the fire when rendered. Now change the Stretch: 2; Regularity: 0.05; Flame Size: 2; Flame Detail: 10; Density: 200 and Samples: 50. These values may vary based on the scaling of your gizmo. My gizmo has a value of 11.694 Radius. And I’m rendering my scene at 640×360 Resolution. Now we’re going to animate the fire. Open up the Time Configuration window (bottom right corner) and change the start time to 0 and end time to 200. Turn on Auto Key. 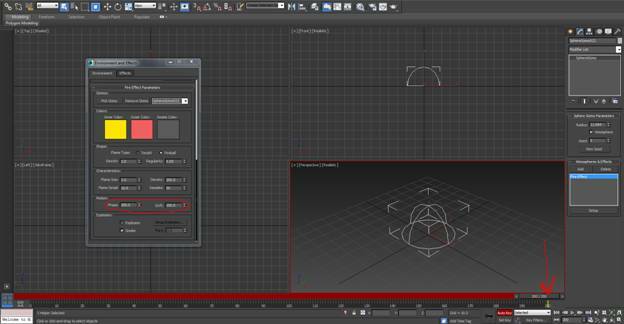 Go to end frame 200 and change the Motion Phase to 200 and Drift to 100 in Environment and Effect setup window. Turn off Auto Key. Now pull the time slider back and forward a few times and check if the values are keying or not. Watch if the Phase and Drift numbers are changing from 0 to the maximum you put in. If you don’t see the numbers change, then redo the step above. Once you have transition in the timeline, then it is time to render the fire. 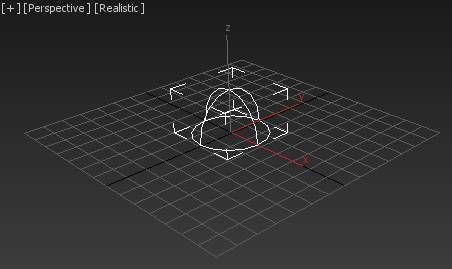 Use a Perspective viewport. 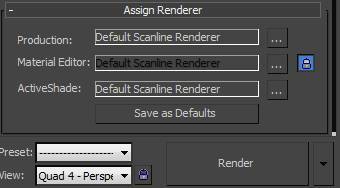 Then from the menu go to Rendering > Render Setup. Change the Range to 50 to 150. 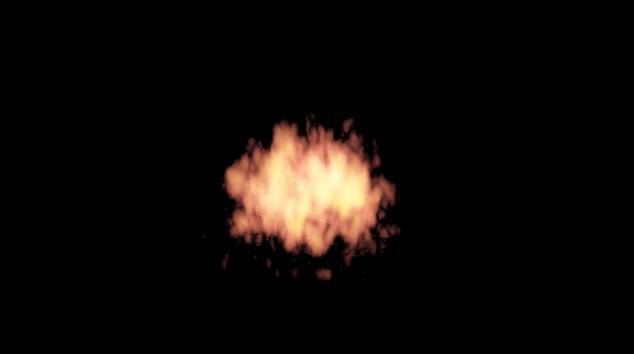 The animation of the fire is slow to start and slows down at the end, so I just cut out the first and last 50 frames. Usually you would Auto Key in a lot more value changes for Phase and Drift on the timeline. 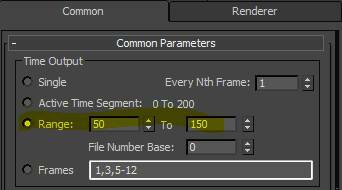 I made this animation simple, so this is why the I set the range for output from 50 to 150, to skip the slow frames. Scroll down to Render Output. Create a save file to render the frames into an AVI movie file. Make sure to put the Renderer to Default Scanline. Click Render and frames 50 to 150 will output into the AVI file you chose above. Here is frame 50 seen below (Use a Perspective viewport before rendering). Let’s make it more interesting by adding a scene. 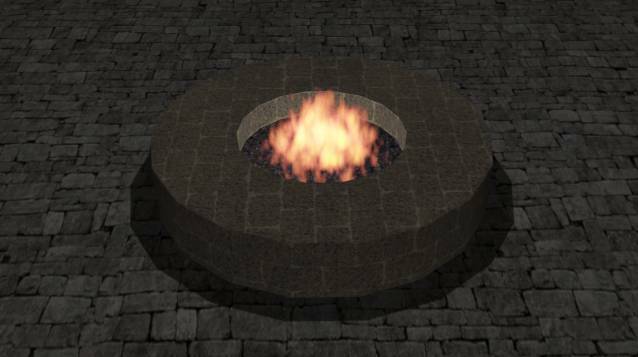 I modeled a stone fire pit. All the textures are brick bitmaps. I have added a few lights and a camera to the scene as well. This is frame 50 rendered with shadows. Remember you can use any kind of Gizmos you like and even multiple gizmos. 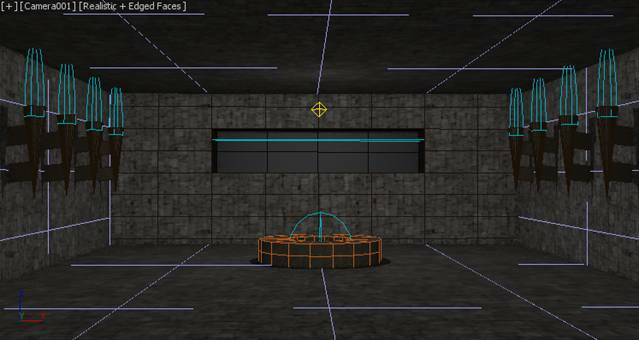 Also you can rotate or scale the gizmos. I changed the settings for a different effect. Flame Type: Tendril; Stretch: 0.8; Regularity: 0.2; Flame Size:18; Flame Detail: 10; Density: 200 and Samples: 50. Below is one frame rendered. Lastly, I used a BoxGizmo for the wall of flames below. 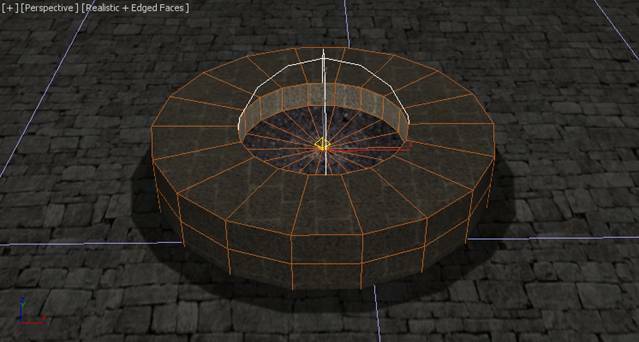 I used the same parameters as the SphereGizmo for the stone fire pit. Note that the fire effects are not visible in the viewport. 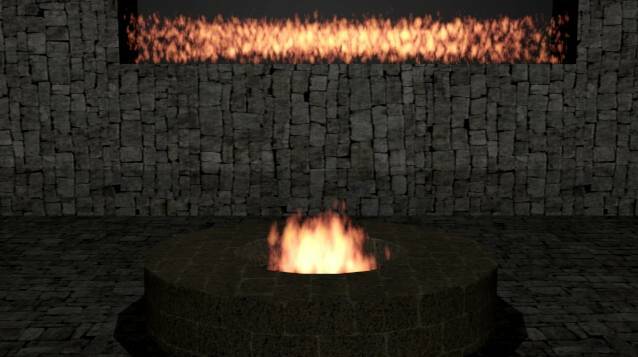 This tutorial just scratches the surface of the things you can do with Fire in 3ds Max. 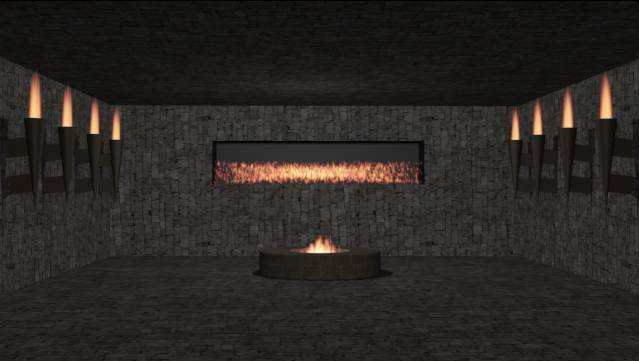 Now that you know the techniques to make fire in 3ds max, try making some animations of your own. 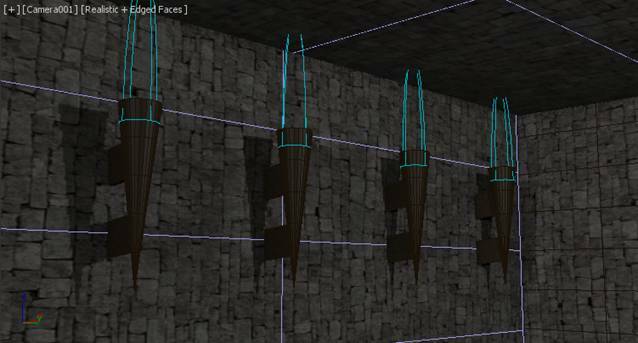 In the next tutorial you will learn how I used Auto-Key frames to animate the dungeon scene (watch the preview at the end of my YouTube video).